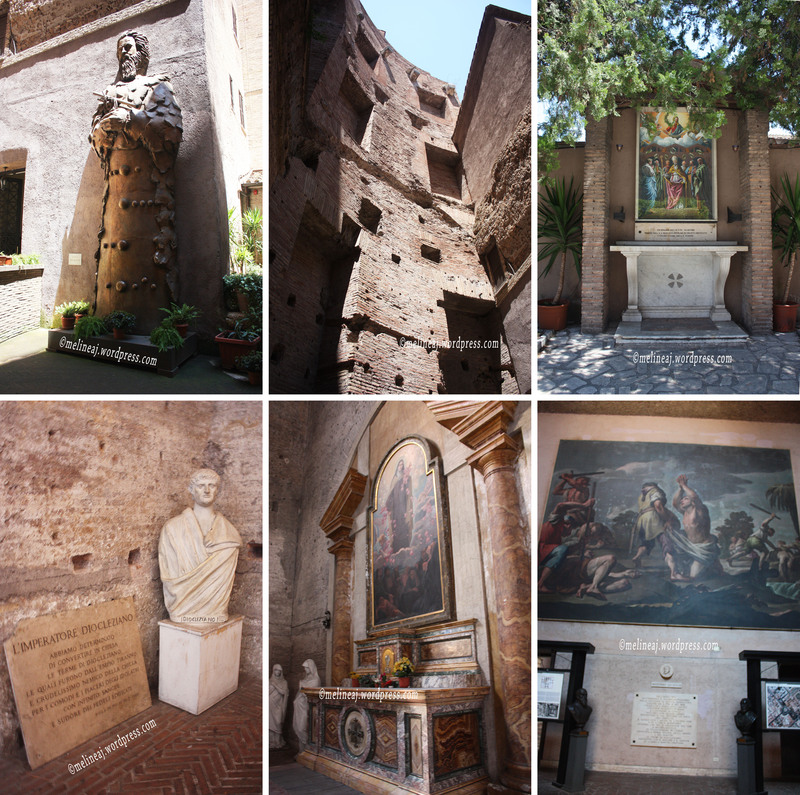 Luckily, we were going to visit Santa Maria di Trastevere that wasn’t too far by walking. This church was kinda hidden among residential area and snuggly located at a corner. At the front of the church, there is a fountain which makes this area looked like a small piazza. We entered the church through a smaller door on the right of the main door. Although the church was rather small compared to the basilica we visited the day before, the decoration in its inside was as grand as any other churches. The golden upper nave and apse contrast against the white marble wall. At the upper nave surrounding the church, there are windows with stained-glass picturing 16 saints. 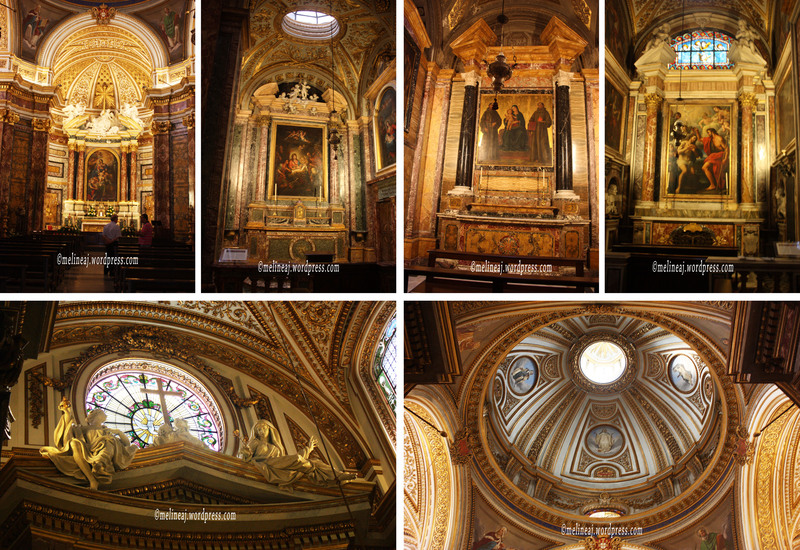 Oh… and I just couldn’t get enough looking at the ceilings of the churches and basilica in Rome! They were extraordinarily beautiful!!!! The golden paint really makes the ceiling popped out! As many churches dedicated for Virgin Mary, the golden mosaic on the apse shows the picture of Christ sharing His throne with Virgin Mary while the saints and apostle were standing around them. We couldn’t really go to near the high altar and the main altar area since they were closed due to a wedding ceremony that was about to be conducted. We didn’t realize this until I saw that the aisle was decorated with fresh white flower and there were a group of violinists practicing songs. My hubby said that we should just wait for the wedding ceremony so we might see what Italian wedding was. However, I wasn’t very comfortable with that (when I had my wedding ceremony the year before at a public park, I was paranoid that strangers would just come up and did something crazy, so I thought my hubby’s idea seemed to be disrespectful for the happy couple). We sat back at the very end of the aisle to admire the church while the violinists serenaded several wedding songs… Ah… so romantic… 🙂 As soon as we saw that couple of people wearing tuxedos and pretty dress came, we left the church to let them prepare for the ceremony. We took a bus to Termini Station and walked to Piazza della Repulica. Here stands Basilica Santa Maria degli Angeli e dei Martiri. This church had the most interesting fascade than those we visited. It was built inside the frigidarium of Bath of Diocletian; thus, it preserved its a red-brick front wall. 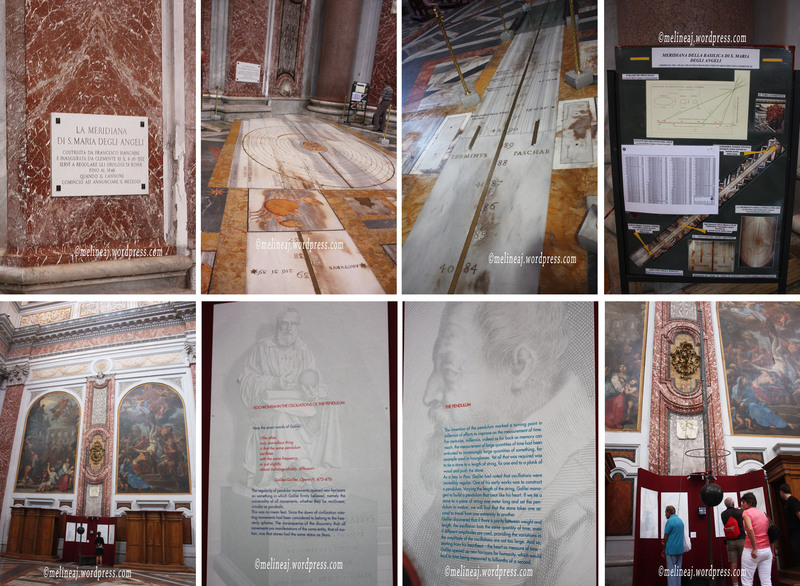 Once, we were inside, it wasn’t as rustic as its front – in fact, Michelangelo was the one who designed the church and had done some works before his death! The high ceiling made the space looked so much bigger than I thought. The marble floor and mostly white wall along with lots of stained-glass windows make the church looked bright compared to its gloomy fascade. There are a lot of painting along the wall near the main altar. There are also several beautiful chapels around, such as Chapel St. Bruno and Chapel of the Blessed Niccolo Albergat located on the opposite side to each other that are decorated with green marble columns. At the left side of Chapel St. Bruno, there is a big traditional organ that is still functioning. At the very back of the building, the golden presbytery looked glowing due to the sunlight coming from the three windows above the main altar. The most interesting part of the church was the Meridian Line on the floor located at the right side of the main altar. According to the history, Pope Clement XI assigned Francesco Bianchini, an Italian scientist, to make a sundial on the floor so that the Catholic church could have an accurate Gregorian calendar to predict Easter (ref). There is a small hole on the church wall in which the sunlight passes through to cast its light at different position along the Meridian line each day (ref). There is also another hole on the ceiling to follow the stars passage. Along with the longitude numbers, there are also signs of 12 zodiacs on the line. Still at the right wing, there’s a model of Galileo Galilei’s pendulum. This pendulum served as a tool to accurately measure the time which in that era was a hard thing to do; i.e. they used sand in hourglass. Galileo found that if he tied a stone to a meter long string, stuck it on a plank of wood, and push the stone; it took the stone one second to travel from one end to another which matched with his heartbeat. Hence, from his invention, we are now able to break down second to “the billionth of second.” There is a 5 meter bronze statue of Galileo Galilei Divine Man at the backyard of the church that was made by Tsung-Dao Lee (ref). 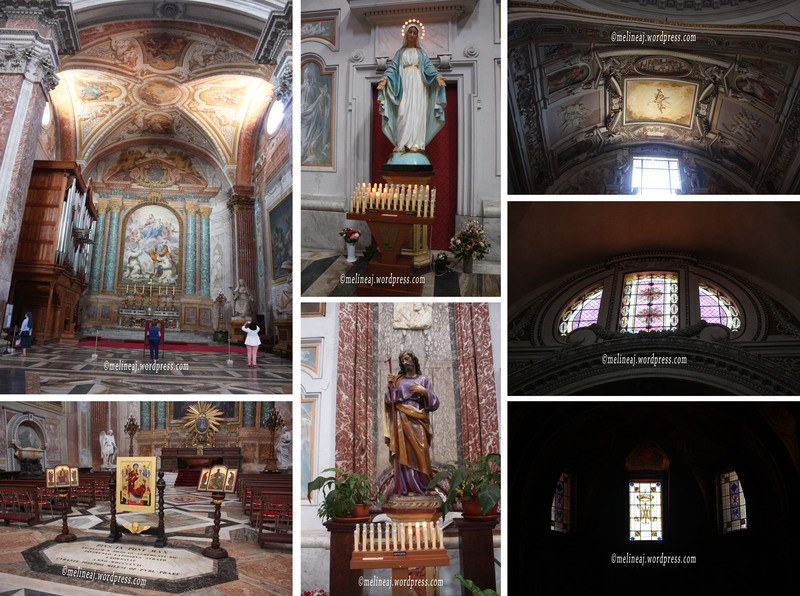 Our next destination was Santa Maria della Vittoria church. 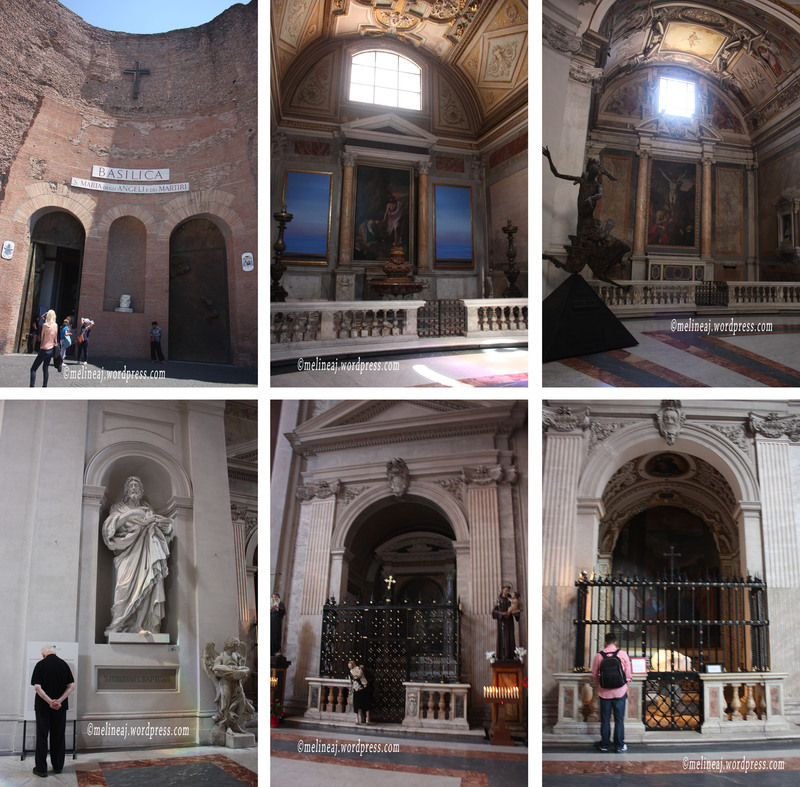 This is where Bernini’s masterpiece, Ecstasy of Saint Teresa, is located. This statue was mentioned several times in Dan Brown’s Angel and Demon novel that makes it so popular. The statue was actually an interpretation of a nun named Teresa of Avila. In her biography, she mentioned that she experienced meeting an angel with a gold spear flaming with fire. Once the spear pierced through her heart, she felt excessive pain and yet the sweet love of God overcame the pain and made her longing more for God (ref). Many people said the details was incredible, especially the carving of the folded fabric of the angel and the nun portrayed in the statue. Hence, I was super excited to see the statue with my own eyes. Many people reviewed that the statue was truly one of Bernini’s best work. We got at the church around 1 pm and it was closed!!!! I saw the sign at the front gate saying that the church is only open from 10am to noon and then again at 3 pm – 6 pm. I was soooo disappointed 😦 So, we just took picture in front of the church and the surrounding area, Fountain of Moses. We then walked along Via Nazionale where there were lots of shops on its side. We went to McDonalds to have a lunch since we were super hungry. To overcome my disappointment, I ordered Pistachio McFlurry. Well… it wasn’t as good as Italian gelato, but any sweet would do at that time 😛 After lunch, we decided to go to Villa Borghese. We took metro from Termini to Fiumicio. At Fiumicio staion, we took an exit that was the opposite of Piazza Popolo. We weren’t sure which bus to take, so we walked uphill to the west side toward the Arch on Viale George Washington. We passed Fontana del Peschiera on the right side and Museo Carlo Bilotti on the left side. Then we saw a bus stop nearby, so we took a random bus and actually got off just one stop after – near the roundabout on Piazza delle Canestre. At the roundabout of Piazza delle Canestre, there were people renting out golf cart and segway. The prices are following: Segway: 30 mins €10 or 1 hour €15; golf cart: 30 mins €15 or 1 hour €25; and bicycle: €2.50 for 2 hours but you have to call to get confirmation code and have your credit card ready. This is a brilliant idea for those who don’t want to walk in this massive park! We decided to rent one segway for an hour since we’d never ride one *and only one because we were cheap hahaha…* The rental asked for our passport and credit card info for their security purposes. He even trained us on how to ride the segway before we took off. At first, I was super nervous since I had to use my body to speed up or down and stop the segway. I was having trouble with stopping the segway actually hahaha… After one or two runs, I got the hang of it and was super excited! I think I rode it more than my hubby although we said that we would share hohohoho…. With me riding the segway and my hubby walking/running, we explored the south east side of the park. When we arrived at Viale JW Goethe, suddenly a thunderstorm hit and it lasted for about 10 mins! We immediately run for cover under a building nearby. A lot of people were surprised too… They were running and soaking wet! For some reason, we forgot to bring our umbrella!!!! When the rain stopped, we braved ourselves to walk/ride back to the area near the rental to return the segway. However, half way back, the rain started to fall again!!! I told my hubby to ride the segway back while I walked back under the tree along Viale Pietro Canonica. My clothes were soaking wet at that moment and suddenly, a couple riding a golf cart were super kind to offer me a ride toward the rental area. Once my hubby returned the segway, we decided to go back to the metro station. We ran to Museo Carlo Bilotti for cover while waiting the bus to come. We laughed ourselves on our way back…. Yes… even a meticulous planner like me could forget one of the essential travelling tool, umbrella! 😛 Anyway, we wouldn’t have the experience of riding segway under the rain anywhere else! So, might as well cherish it 🙂 Whenever I hear “Villa Borghese” now, all I can think was our wet -yet fun- experience hahaha…. Once we got off at Fiumicio station, we took the metro to Spagna station and walked back to apartment. Luckily, the rain had stopped but yeah… we were soaked. While walking back to the apartment, we visited Sant’Antonio dei Portoghesi, a Portugese church near our apartment. Although we passed this church so many times, it always closed. Apparently, the church was under renovation. 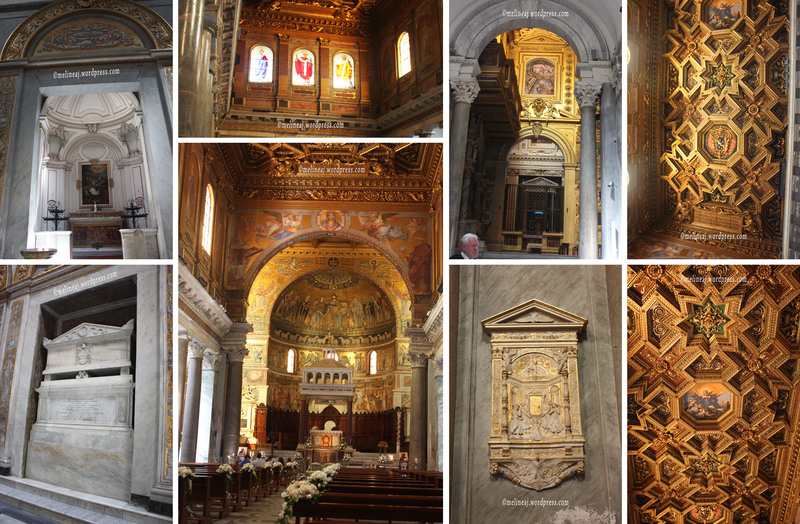 When we peeked for a second, it was as beautiful as any other church in Rome. The decoration style was a bit different because of the Portugese influence. Anyhow, the marble columns and the gold painted ceiling never failed to amaze me! We rested for 2 hours at the apartment while freshening up ourselves and packing up for tomorrow’s departure. Since we still couldn’t connect to the WiFi, we went to look for free WiFi a.k.a went back to the spot that we found the day before hehehe…. (There was an internet cafe nearby but we were too cheap and opted to sat in front of the store to ‘steal’ the WiFi hahaha). Once we were connected to the internet, my hubby asked me to check for our Barcelona itinerary. I opened my Dropbox file and scrolled through our itinerary and figured out that we missed one of dessert place that my friend recommended, Pompi! 😛 Immediately, I insited that we must go there!!! My friend said that Pompi has the best tiramisu she’d ever eaten and prior to our trip, she reminded me couple times. So, this must be good! Pompi actually has several branches throughout Rome. However, the store at Via della Croce (near Piazza di Spagna), that was closest to our apartment, only opens until 7pm – and it was 6.30 pm when we browsed the internet. 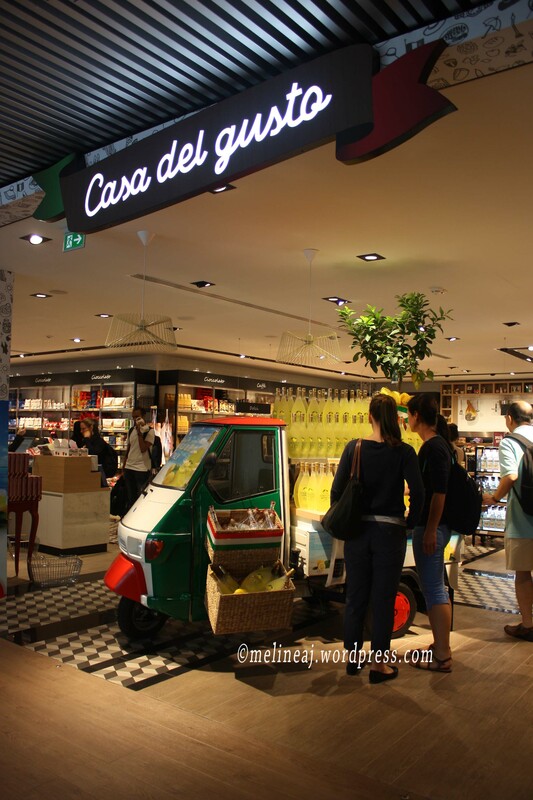 So, we decided to go to the main store at Via Alba Longa – even though it was far from where we were. 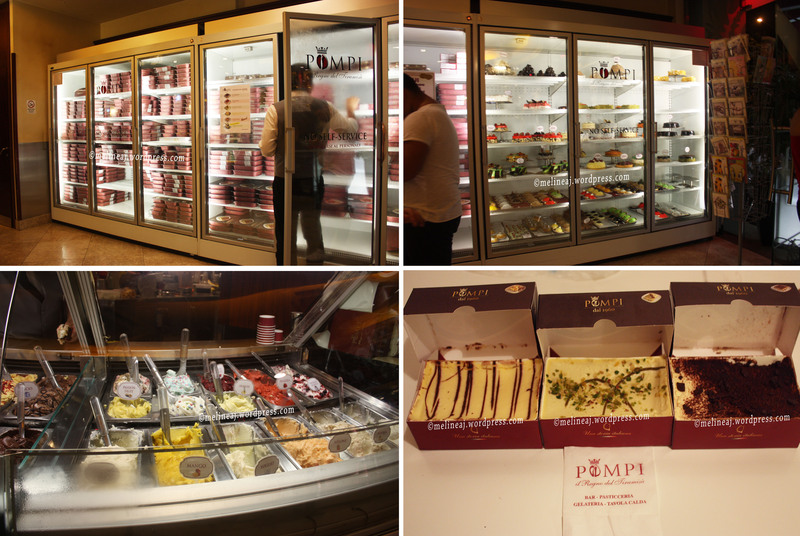 Next, we were off to Pompi that was claimed to be the best tiramisu in Italy. The nearest metro to this location is Re di Roma. This roundabout has several road branch out from it. We looked for Via Alba Longa and walked along this road and found Pompi shop on the left hand side of the road. It was quite late at night when we arrived and the area looked so dark and quiet. However, once we approached the shop, we saw lots of people enjoying gelato and/or tiramisu on the front porch. I swore I was screaming with joy when I found the shop. My hubby said that I had the biggest smile on my face hahaha…. A personal box of tiramisu is €3.50. You can choose different flavors: classico, pistachio, banana & Nutella, hazelnut-new, fragiola/strawberry, and pina colada, their summer limited edition. Not wanting to waste any chance, I bought 3 personal boxes: classico, pistachio, and banana & Nutella! My hubby thought I was crazy hahaha…. Well… since that was my first and probably last time going there, I might as well bought a lot to satisfy my curiosity! 😛 My hubby bought a gelato with cassata sicilia & chocolate. For me, the gelato was just ok. I like the smoother texture of Giolitti’s but my hubby liked it.